Several years ago, on another moment of weakness for pretty things I found myself purchasing a cotton duvet with a very romantic floral print. I think I would have been overjoyed to get curtains with such a print on my room when I was but a wee lass on the 1980's. Anyway, my planned destination at the time for it was a summer dress. As I have during past years been up to my neck in historical sewing projects for the most part I never quite got to actually beginning the dress, though I had several different plans of what is should be like. 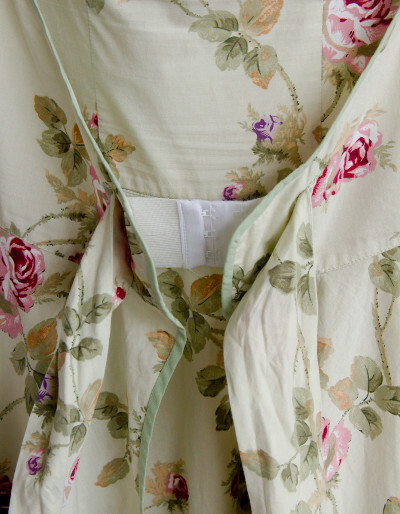 Finally a friend showed me an interesting vintage pattern, and I was convinced that this would be my floral print dress. 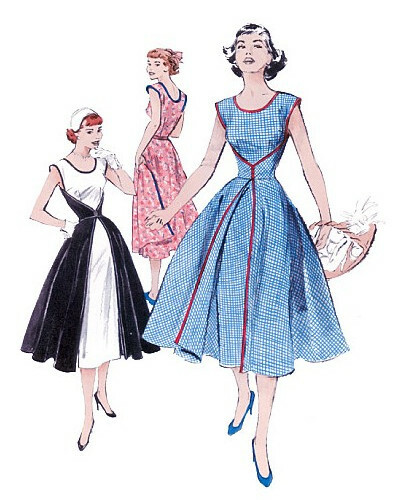 When one is used to wearing modern elastic materials a cotton dress has some disadvantages. It tends to either hang loose or feel tight and uncomfortable (especially after a good meal). The idea of a wrap dress appealed to me for being adjustable. On the other hand a cute button closure at the front would not give any fitting allowance at all, and the ribbon ties often used in wrap dresses don't always work so great either. At last I came up with an idea of elastic band closure with hooks. I made the front edges double layered to keep them neater and sewed on the elastic bands some distance from center front. I stitched wide bands on the top over the ends of the elastic bands to tie into a cute bow to keep the front edges down. I reasoned that two rows of elastic band at the back would give the front bodice a better fit than just one. I also continued the bodice a bit towards the back on the sides. Three pairs of wide bra closures cost about as much as the original duvet on sale, but thats how it always goes - you find a bargain material and them somehow end up using a lot of money for the trimmings. On the original pattern the front edges of the full top circle skirt were cut straight, but when I tried the dress on I thought it would look nice if they gapped a little, especially as I had cut the under layer fuller too, so I shaped them a little. 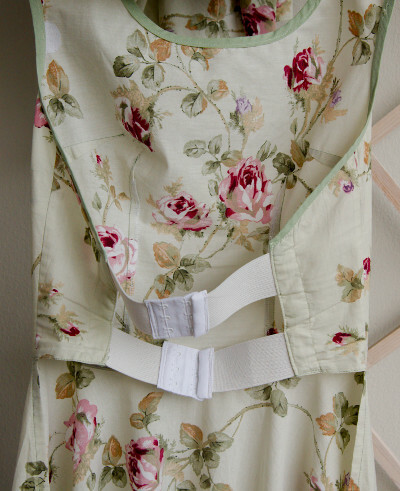 Bias tape was an easy and neat finish for the unlined dress. I considered wine red tape for a while, but chickened away from the stark contrast and chose a non-conspicuous shade of green instead. A stronger color in the binding would have brought the wrap-design out more, but somehow I had grown very fond of the more subtle prettiness of the romantic print and didn't want more contrast to steal attention from that. So, did my elastic-band-and-bra-hooks idea work? Yes and no. In the end the short strips of elastic band don't give that much fitting allowance, but at least the dress looks neat and tight without wrinkling too much, as easily happens to a tight dress made of light non-elastic material. As you can see on the picture, the elastic band does peep out between the front edges, I should have cut them to overlap rather than meet. The bow doesn't cover this, but hopefully at least distracts a bit. A circle skirt of a light material can cause some embarrassment on a breezy day, let alone a wrap skirt. The flared underskirt had felt a bit too wide and heavy on the fitting, but when wearing it at least had the advantage of covering the whole front and well into the sides of the tulle petticoat, especially when fastened with safety pins. This made the front edges flying around a bit less awkward. So, it turned out a be a very pretty and classically feminine dress, still fairly cheap and fairly quickly finished when I at last got started.